10 years of Webinars: Who are FXStreet’s longest running speakers? KUDOS to all of them! We want to thank them heartfully for their tons of hours dedicated to give their views and share their knowledge with our audience which were, in total, thousands of traders. I’d also like to mention other speakers who’ve stopped doing webinars with us but are still contributing on our websites in other ways: Valeria Bednarik (first webinar in May 2006), Rob Booker (April 2006), Adrián Aquaro (March 2005 – still doing webinars on our Spanish website nowdays!) and Raúl López (January 2007 – still in Spanish). First called “Live sessions”, we started organizing chat sessions (text typing) in April 2005. We started using hotComm (voice and screensharing broadcasting) for our webinars in mid-2006 approximately. 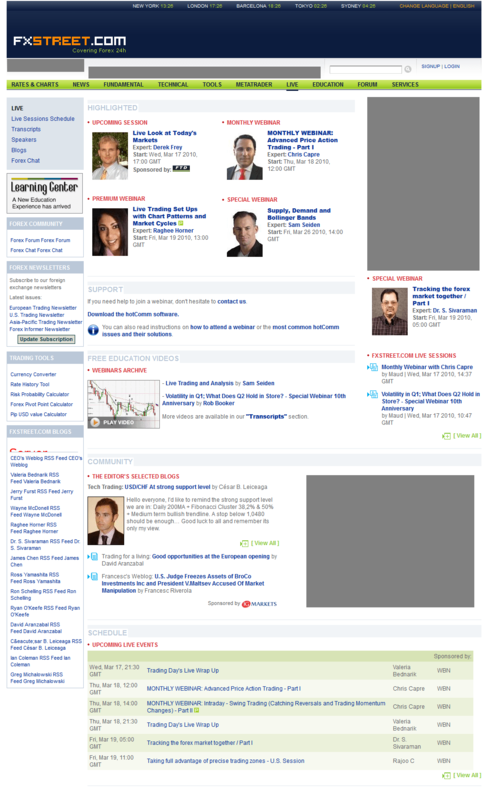 Click on the snapshot image at the left, it’s our “Live” page back in 2009. you’ll see some of them names I’ve mentioned: Derek Frey, Dr Sivaraman, Chris Capre, Valeria Bednarik and Sam Seiden. The very first webinar (back then called “Q&A sessions”) that FXStreet hosted was presented by Adrián Aquaro. It was on Thursday March 31st 2005: “Momentum: a powerful indicator”. 10 years today… Happy Anniversary! Webinars and FXStreet have been having a long love story. And we have no plan to stop putting together these online meetings with traders from around the world gathered around speakers who are passionate about teaching! Congratulations for building such a wonderful community! I have given 350+ hours of webinars at FXstreet.com and every minute has been fun and rewarding. I am fortunate to be associated with http://www.fxstreet.com chat session since 2001 and Q & A session since 2003.Befre Noemi, Clarie was the one started moderating such interactive sessions. To my understanding the most successful interactive sessions are conductioed only by Fxstreet.There are many other websites copied the webinars and contacted the fxstreet speakers to give webinars in their websites and could not get similar response.So the pioneer is still recognised by all the traders to have effective interaction with speakers. responsible for all the implementation of ideas when online was at nacent stage.